Delivering Excellence. The LeChase Way of Building. 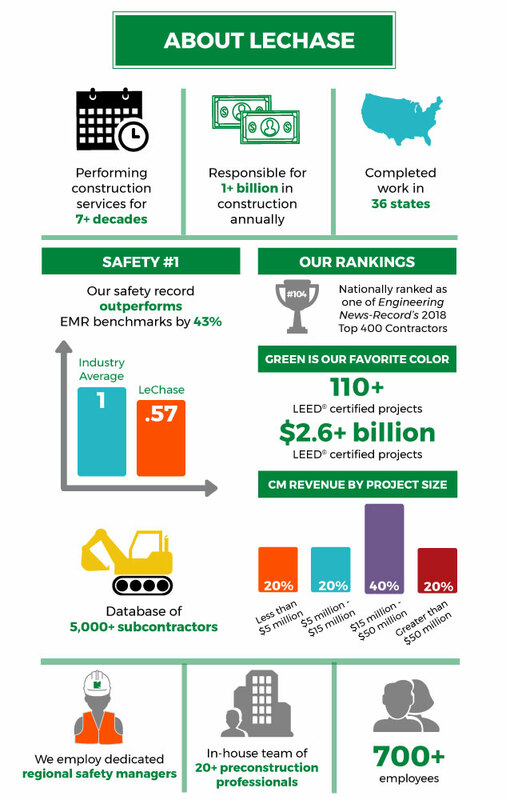 At LeChase, we deliver excellence that drives success for our customers, our employees, our company and the communities we serve. It’s a lofty goal, but one that we’re committed to achieving every day, on every project. That means an unwavering dedication to integrity and ethical behaviors, safety and stewardship—a way of doing business that’s embraced not because it’s in some manual, but because it’s in our DNA. It starts with a commitment to safety. Our Zero Incidents program is designed to help ensure everyone returns home safely each day. While our incident rates are among the lowest in the industry and many of our safety programs already surpass OSHA requirements, we never stop looking for ways to improve. You don’t become a world-class leader by standing in place. It takes exceptional people to deliver excellence. That’s why we make hiring, training and retaining the best people in the industry a top priority. Our employees are encouraged to take on leadership roles, pioneering approaches to construction methods and materials that often result in new benchmarks for the industry. People who feel good about coming to work do the best work, and our people are the reason we’re a success. Delivering excellence for our clients builds trust and confidence, resulting in long-term relationships and repeat business. It’s no surprise—at least to us—that our clients are often our most enthusiastic advocates. They know first-hand what it’s like to work with LeChase Construction, so they know they can recommend us with confidence. We’re LeChase Construction, and we deliver excellence. That’s just our way.